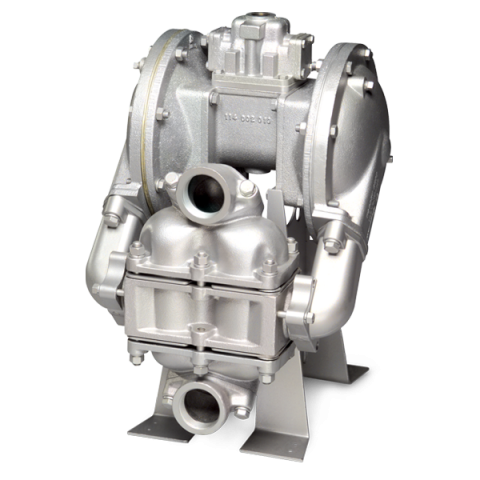 Sandpiper AODD Heavy Duty Ball Metallic Pumps are ideal for thin to highly viscous and small solids-laden fluids, while providing excellent suction lift capability and exclusive variable porting options (side, top, bottom and dual). HDB pumps are thick wall constructed of Sand Casted Aluminum, Cast Iron, Stainless Steel or Alloy C with elastomer, TPE (thermal plastic elastomers) and PTFE options in diaphragms and check valves. HDB pumps are enhanced with an extended wear package. Suction / Discharge Port Sizes: 1" through 4"